It’s this ‘incredible India’, our very own motherland that has produced stalwarts in music in the days gone by, living legends of today and budding prodigies of tomorrow. With this music rich country, a treasure to safeguard and carry on down the generations, the All India Music Group has come together to nurture the Indian music form and ensure that its kept alive in tradition. The AIMG had its first session at Mumbai on January 2007 (refer under Sudha Speaks in this web site –Towards a musical cause). It was decided by the Group that they would have the next session in the South and Sudha be the moderator…so Chennai it was! The morning dawned bright and sunny on 3rd of March 2008 and at the ITC Chola Sheraton at 3pm, a sweeping glance across the Sagari Conference Hall showed a large gathering of the Press and Media. A keener look towards the middle revealed a well laid out table behind which were the legends, all seated to speak to the Press on their fledgling venture – the All India Music Group, it’s aims, it’s ambitions and its goals. It was a beautiful and memorable sight to see these stalwarts all on one platform – Pts. Rajan & Sajan Mishra, Pt.Ajoy Chakraborty, Ustad Zakir Husain, Pt.Arvind Parikh, Pt. 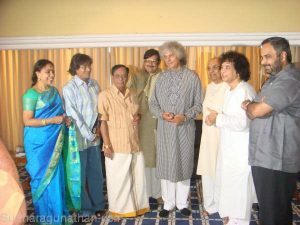 Shiv Kumar Sharma, Dr.M.Balamurali Krishna, Mandolin U.Shrinivas and Sudha. Replying to the volley of questions from the Press, the artists wielded the microphones individually and spoke towards the cause of music, its propagation and its sustenance. To a question on why cannot music be considered as a compulsory curriculum in schools, Pt. Shiv Kumar Sharma replied that this has already been proposed to the Government. Pt. Arvind Parikh affirmed that when they had approached the Information and Broadcasting Ministry and laid down their cause, there had been a resultant increase in budget allocation from 33 crores to 49 crores. There was a request for a Hindustani Music Channel and an Appellate Authority for Music. Pt. Arvind Parikh stressed that there were about 13000 B Grade Artists across who most certainly need to be nurtured to carry on the mantle of music. 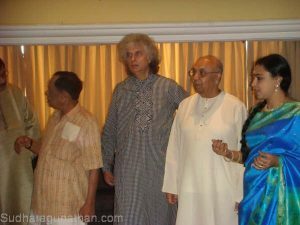 Ustad Zakir Husain appealed to the group to contribute and play vital roles in the preservation of music before it gets completely diluted. The Jindal Business House has adopted a segment where music by this high profile group is also taken to the rural neighborhood. Pt. Shiv Kumar Sharma spoke of an occasion when the Dutch Consul General was present in one of the performances, and absolutely taken up by the Indian culture, had requested a couple of the Indo Dutch Insurance Companies to work on assisting the veteran musicians with insurance. Pt. Parikh spoke about how they were able to ensure a permanent slot in the AIR where 50 artistes perform every week He also informed of speaking to the government on tax exemption to the corporates when they finance events. To a question as to how would the AIMG sustain this movement, the Ustad smilingly replied…”Well we have survived so long…”. To another poser as to how does the AIMG intend handling the finances, the Ustad was again very clear and categorical. “We do not handle the finances but facilitate with our art.” Pt. Ajoy Chakraborty spoke about the right information of the musical activities reaching the people, emphasizing the need for greater propagation of the arts. The Ustad spoke of Corporates adopting artists. Dr. Balamuralikrishna spoke of artists needing to be given prominence in the front pages of the dailies and not be always relegated to small columns. Subsequent to a volley of photo sessions, the media dispersed at 4 pm to give way to the Corporates. In a discussion room, with the stalwarts on one side of the table and the Corporate representation on the other, began a discussion on how the Corporates could play a key role in taking this noble venture forward. The elite gathering comprised of Dr. Nalli Chettiar, Partner Nalli Silks, Mr..A.Natarajan, former Director, Door Darshan Kendra, Mr. Kumar Ramanathan, Operations Director, Vodafone Essar, Mr. M.Murali, Managing Director, Sri Krishna Sweets, Sri.L.Sabaretnam, Director, CPCL, Mr.Raghunath Narayanan, Europa Group, Mr. M.C. Ragunathan, Director,Amudham Music Ms.Indra Subramanyam, Managing Director, Ehrlich Laboratory and Mr.Sairam, Vice President, Kotak . The next one hour saw the group speaking about the opportunities and the way forward. Dr. Nalli Chettiar briefed the group on the role his organization played in the upkeep of music and culture. Mr. Kumar Ramanathan spoke of a continued engagement in the likes of Vodafone’s Rangshankara at Bengalooru, where there was a medley of events spun around a central theme, which would prolong over a period of a few years as an engagement. This would also ensure a continuous relationship for the cause. Mr. Sabaretnam was keen to take the ideas of nurturing budding musicians and expressed great interest in the activities that AIMG had lined up. Ms. Subramanyam spoke of how the Rotary could also join hands with the AIMG and work on short programs continually. The meeting ended on a very positive note with the Corporates assuring their support and lauding the steps that the AIMG is intending to take up. Sudha thanked the group for their time and the session concluded with a photo shoot with the stalwart musicians and the Corporate group. An ambitious venture begun with all sincerity for a strong and deep rooted cause by world renown Indian musicians, stretching their hands out to the Corporate barons for support ..to ensure that the musical treasures of India are safeguarded and sustained for generations thereafter. Well done AIMG, and with Sudha as the Southern representative, will surely spell success in all its ambitious ventures for the cause.